Choice is yours. Plenty of hotels, serviced apartments, or guest houses in bangkok. For staying in the inner city area, most travellers like to stay in Victory Monument, Sukhumvith, or Sathorn areas. Compared to Sukhumvith and Silom areas, costs of accomodation in Victory Monument area is the most reasonable. More, Victory Monument is the transportation hub of Bangkok; sky train, bus, mini bus. So, it is very convenient for you to go anywhere around Bangkok or even around Thailand. 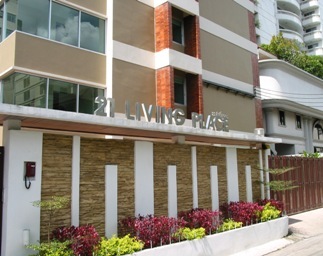 21 LIVING PLACE is a newly exclusive serviced apartment, traditional architecture combined with contemporary interior design concept offer modern and stylish living right in the heart of Bangkok, Soi Rangnam, Victory Monument. Bangkok sky train, the most rapid transportation to get you around Bangkok is only just a stone throw away. The Bangkok’ largest and newest shopping area such as Siam Paragon, Central World Plaza, Siam Discovery, Mahboonkrong and many more is only a couple sky train stations away. Also, the well known weekend market, Jatujak Market, is just a few stations away from us. To visit Bangkok’s historical and cultural area of Rattanakosin Zone is not a hassle at all since the central bus station at the Victory Monument is only five minutes walk. Ideally located in the newly upcoming area as well as within the heart of Bangkok but yet situated in a peaceful environment. Suan Santiphap, public park, is so close that you can leisurely walk around every evening. King Power Duty Free Mall is just opposite where you can shop tax free items.